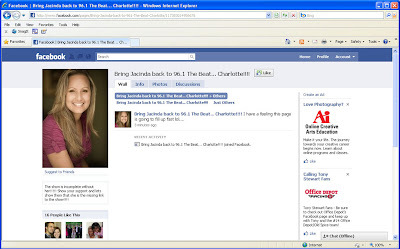 Since Jacinda Garabito was surprisingly let go a few weeks ago from 96.1 The Beat's A.M. Mayhem morning show, I've watched as many of her loyal listeners have bombarded her personal Facebook page with comments about how much they miss her, how stupid the station was to let her go, and how the show isn't the same without her (they especially miss her doing "The Sleeze"). Jacinda has been admirably gracious in her replies, not once bashing her former employer. Well, one of her Facebook friends isn't ready to let go--this morning Melissa Yourchisin from Huntersville created a Facebook page called "Bring Jacinda back to 96.1 The Beat... Charlotte!!!!" It popped into my newsfeed soon after and in a couple of minutes I watched it go from eight followers (Likes) to 16 (and about 10 minutes later as I type this there are 29). A few Facebook campaigns have worked in the past, like the guy who successfully lobbied to get Betty White to host Saturday Night Live (she's hosting SNL May 8). The Beat and Brotha Fred have been soliciting candidates to replace Jacinda for about the last three weeks, and this week they've featured on-air interviews of candidates. I listened to part of one the other morning, but I don't know how the ladies vying for the spot have been doing (you can learn about them here). It'll be interesting to see how much steam the Facebook campaign to bring back Jacinda gets and whether or not the radio station takes notice. UPDATE: Click here to read about Jacinda's latest endeavors. This is awesome lol. I didnt realize that me making that page would grab so much attention. HOPEFULLY the station will listen and let the LISTENERS vote for Jacinda... after all isnt the show supposed to appeal to the listeners??? Considering the mess the whole competition started and they still have not found anyone that comes close to Jacinda they should bring her back. Yes that competition was a marketing scam they may hire someone from the videos but come on it was not what they said if I was Jacinda I would not want to go to work for people that lie and scam their listeners anyways she is better off with out them. Jacinda let us know where you go next so we can all follow you and dump the cheats. If I was Jacinda, I would want nothing to do with them! I no longer listen to 96.1 the beat in the morning. Jacinda was my favorite and was the entire reason I listened. I liked her point of view. It was definitely a horrible decision on the station's part! Morning.. I as well dont really listen to the show anymore. I liked the chemistry that the previous cast had together. Jacinda gave a "different" point of view on topics. This new girl holly just seems so "lilly".... never mind that, but anyway I miss her as well! The show really messed up. And the sleeze is def not the same anymore. This new girl covers clebs that nobody really cares about. Oh well.